WALTHAM, MA--(Marketwired - April 16, 2015) - Elsevier, a world-leading provider of scientific, technical and medical information products and services, today announced the publication of six new books focused on the applications of advanced materials. The introduction of these books coincides with the Society for Biomaterials 2015 Annual Meeting and Exposition, held April 15-18 in Charlotte, NC. Learn more about what Elsevier editors and authors are doing at the conference here. Also at the Society for Biomaterials Annual Meeting, Dr. Jack Lemons, University Professor of Biomedical Engineering at the University of Alabama at Birmingham School of Engineering, will receive the highly acclaimed 2015 Acta Biomaterialia Gold Medal Award. He has co-authored or edited 10 books, published more than 200 journal articles, and contributed more than 600 presentations and abstracts at scientific meetings. Recent Elsevier books include Biomaterials Science, 3rd Edition: An Introduction to Materials in Medicine and the Biomedical Engineering Desk Reference. His central research theme focuses on surgical implant biomaterial-to-host interactions as related to biocompatibility under functional conditions. The Acta Biomaterialia award recognizes excellence and leadership in biomaterials, including basic science and translation to practice. Published by Elsevier, Acta Biomaterialia is an international journal of peer-reviewed original research reports, review papers and communications in the field of biomaterials science. 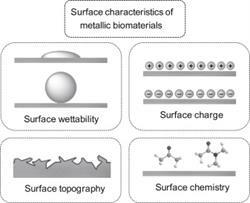 From Surface Coating and Modification of Metallic Biomaterials, Chapter 1 Figure 1: The variety of surface characteristics that influence the biological response to an implanted material. Cellular response and bone formation are affected by a series of surface properties, not a single property alone. The role of a specific surface characteristic has to be investigated in the context of the other characteristics; otherwise misleading conclusions may be drawn. 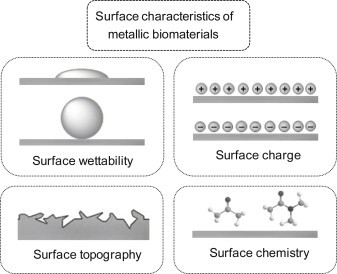 Figure 1.1 summarizes the key surface characteristics that affect tissue-biomaterials interactions. From Switchable and Responsive Surfaces and Materials for Biomedical Applications, Chapter 1 Figure 7: Micelles of thermo-responsive polymers used as controlled drug delivery vehicle. Surfactants have been used for micellar solubilization of hydrophobic drugs. The micellar structures generated using surfactant molecules have been used in delivering poorly soluble or hydrophobic drugs. These micellar structures can be loaded with hydrophobic drugs during their assembly and can be used to release the drugs on application of a temperature trigger, as shown in Figure 1.7. 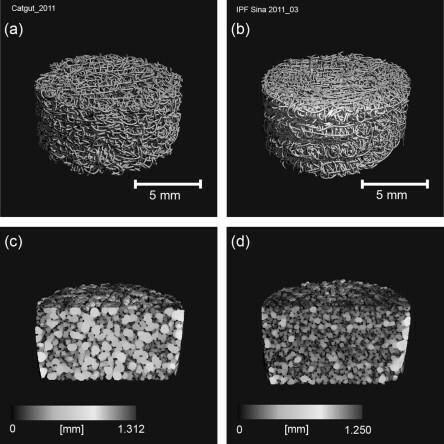 From Biomedical Textiles for Orthopaedic and Surgical Applications, Chapter 2, Figure 7: μ-CT analysis* of scaffold stacks (a, b) as a rendering of the thread structure and (c, d) filled up with spheres representing the pore sizes. Panels (a, c) represent a scaffold stack of seven plies embroidered with 1.9 stitches/mm2 porosity 85%; (b, d) show a stack of four plies embroidered with 5.8 stitches/mm2, porosity 76%. 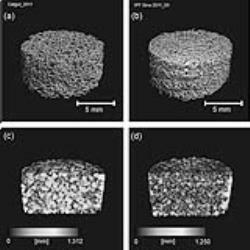 (*) μ-CT analysis performed by Dr. Ricardo Bernhardt, TU-Dresden, Max-Bergmann-Centre for biomaterials.